The water system supplies more than 5 million people in Sydney and the Illawarra, Blue Mountains, Shoalhaven, Goulburn and Southern Highlands regions. WaterNSW collects water from river catchments to the south and west of Sydney, stores it in 10 major dams, and transports it via a network of rivers, pipes and canals to water filtration plants. Most of the water from Sydney's catchments is supplied to Sydney Water's nine filtration plants for treatment and distribution to customers. More than 80% of Sydney's water is treated at Prospect water filtration plant, which supplies 3.7 million people in Sydney. This complex system is highly flexible and can be reconfigured during times of drought, high rainfall or during maintenance to ensure only the best quality water is supplied to customers. Water is released from dams as environmental flows, to maintain the health of downstream river systems. See the total system schematic diagram at the bottom of this page. 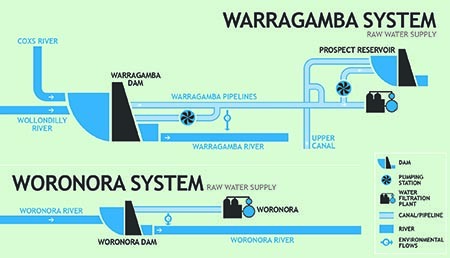 Download a larger version of the Warragamba and Woronora system schematic at the bottom of this page. The Warragamba system supplies water to more than 3.4 million people living in greater Sydney. Water from the Coxs and Wollondilly rivers flows to Warragamba Dam, one of the world's largest domestic water supplies. Water flows by gravity through two pipelines, 27km to Prospect water filtration plant, which supplies 75% of Sydney. The dam also supplies Warragamba, Penrith and the lower Blue Mountains via water filtration plants at Warragamba and Orchard Hills. Water is released into the Warragamba River to provide a secure water supply to the people of North Richmond and as environmental flows to keep the river healthy . The Warragamba system can be topped up by water from the Shoalhaven system. Water from Wingecarribee Reservoir can be released into the Wingecarribee River, which flows into the Wollondilly River and Warragamba Dam. A deep water pumping station has been constructed at Warragamba Dam to enable continued supply if the water level falls below the outlets during a severe drought. The Woronora system supplies water to residents in southern Sydney and northern Wollongong. Rainfall in the catchment area, located in bushland about 40 kilometres south-west of Sydney, flows to Woronora Dam, which lies in a narrow gorge on the Woronora River upstream of its junction with the Georges River. The dam supplies water to parts of the Sutherland Shire, Helensburg and Stanwell Park. Water is also released into the Woronora River as environmental flows, to keep the river healthy. Download a larger version of the Nepean system schematic at the bottom of this page. The Upper Nepean system supplies water to Sydney, the Macarthur and Illawarra regions. Nepean Dam supplies Bargo, Thirlmere, Picton and The Oaks from the Nepean Water Filtration Plant. Avon Dam supplies the Illawarra region from the Illawarra Water Filtration Plant. A tunnel between Avon and Nepean dams allows the transfer of water to the Illawarra from the Shoalhaven system. Water is also released from the four dams into the Upper Nepean rivers as environmental flows to keep the rivers healthy. Water from Avon, Cordeaux and Nepean dams can be released to Pheasants Nest Weir, while water from Cataract Dam can be released to Broughton Pass Weir. The 7km Nepean Tunnel under Wilton connects Pheasants Nest Weir with Broughtons Pass Weir. The Macarthur Water Filtration Plant extracts water from Broughtons Pass Weir to supply the Camden, Campbelltown and Wollondilly council areas. From Broughtons Pass Weir, water can be released to the Upper Canal, a series of tunnels, aqueducts and open canals, which flows by gravity 57 km to Prospect Reservoir to supplement Sydney's water supply. Water is also released from Broughtons Pass and Pheasants Nest weirs as environmental flows, to keep the lower Nepean River healthy. Download a larger version of the Shoalhaven system schematic at the bottom of this page. The Shoalhaven system supplies water to parts of the Shoalhaven and Southern Highlands, and tops up Sydney, Goulburn and Illawarra water supplies. Water released from Tallowa Dam into the Shoalhaven River is used by Shoalhaven City Council to supply Nowra and surrounding area. Wingecarribee Reservoir supplies Bowral, Mittagong, Moss Vale and various villages via Wingecarribee Shire Council's water filtration plant. Bendeela Pondage supplies Kangaroo Valley township. Water from Wingecarribee Reservoir can be released into the Wingecarribee River, which flows into the Wollondilly River and Lake Burragorang to top up Sydney's main water supply at Warragamba Dam. Water can also be released from Wingecarribee Reservoir via canals and pipelines, collectively known as Glenquarry Cut, into the Nepean River which flows into Nepean Dam. From there it can be transferred to Sydney via the Upper Canal or to the Illawarra region via the Nepean-Avon tunnel and Avon Dam. Wingecarribee Reservoir can top up Goulburn's water supply during drought, via an 84km pipeline. Water is also released into the Shoalhaven and Wingecarribee rivers as environmental flows, to keep the rivers healthy. 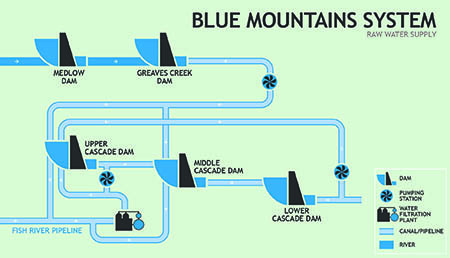 Download a larger version of the Blue Mountains system schematic at the bottom of this page. The Blue Mountains system sources water from within and outside the Blue Mountains catchments, a small group of bushland valleys that feed water to Lake Medlow, Greaves Creek and the three Cascade dams. These five dams provide water for the Cascade water filtration plant at Katoomba, which supplies the middle and upper Blue Mountains. Supplies can be topped up when needed with water from Oberon Dam or Duckmaloi Weir via a pipeline from the Fish River Scheme, west of the Great Dividing Range at Oberon. Fish River Scheme water can top up the Upper Cascades Dam, or go directly to the Cascade filtration plant. The lower Blue Mountains community is supplied with water from Warragamba Dam, treated at the Orchard Hills filtration plant, which also supplies the Penrith area. Schematic diagram of the raw water supply system for the Upper Nepean. Schematic diagram of the raw water supply system for the Blue Mountains. Schematic diagram of the raw water supply system for Warragamba and Woronora. Schematic diagram of the raw water supply system for the Shoalhaven.